It was Pep Guardiola who forecast that all the best players of the future would be positionally flexible. There used to be a certain reassurance about centre-back who could only head and tackle, strikers who just scored and goalkeepers who only stayed within their 18-yard box. Such parameters are slowly disappearing, however, and describing exactly what type of footballer a player is, is becoming harder to define. 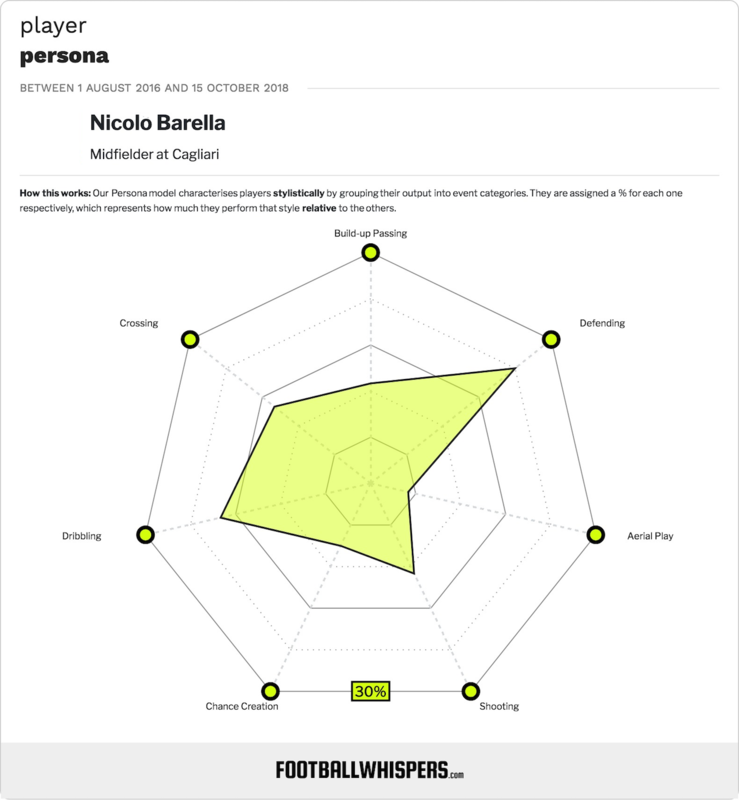 Nicolo Barella of Cagliari is one such individual who seems to conform to Guardiola’s theory. A midfielder who can do a bit of everything without possessing one defining characteristic, he has emerged as one of Italian football’s most intriguing young talents. Tactically flexible is something Jurgen Klopp has opened himself up to this season as he looks to take Liverpool to the next level, but not necessarily with his trademark high-pressing 4-3-3. It’s yet to fully bear out, and we’re only two months into the season, but his signings have implied he wants players, particularly midfielders, who are multi-skilled. 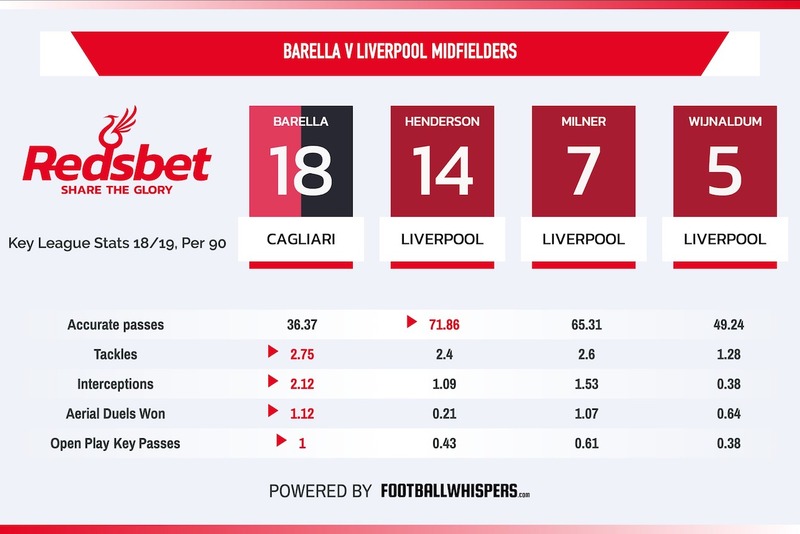 With reports linking the Reds to Barella, our friends at Football Whispers profile the 21-year-old, analysing his strengths, weaknesses and what he could bring to Liverpool and the Premier League. There is no magic formula for cultivating a special talent as a child into a fully-fledged professional player of world-class potential, but in the case of Barella he appears to have followed a textbook path to the top. Cagliari born and bred, the Sardinian joined the club’s academy in his mid-teens and was capped by Italy as early as at Under-15 level, working his way up all seven grades to the U21s. He was a driving force of the young Azzurri sides who finished second at the U19 European Championships in 2016 and third at the U20 World Cup in 2017. At club level he made his Serie A debut at the age of 18 towards the end of the 2014/15 season as Cagliari were relegated to Serie B. A loan spell at Como the following campaign grew his first-team experience and he has been a regular for the Rossoblu in the top-flight since returning. It was former Italy coach Gian Piero Ventura who first called him into the Azzurri squad last autumn with Roberto Mancini handing his debut earlier this month, starting in a midfield three alongside Jorginho and Marco Verratti against Ukraine. How long have you got? Barella, at the risk of making him sound like a ready-made superstar, seems to do everything well. From the basics of the game – passing, shooting, dribbling and tackling – to more nuanced attributes like positional awareness and dictating tempo, the youngster really has got the lot. It’s reflected in his numbers for the season as he ranks 20th (2.75) and 12th (2.12) among Serie A midfielders for tackles and interceptions per 90 minutes but also is 21st (1.62) and 19th (1.0) for scoring attempts and take-ons. He has played as a holding midfielder, utilising his understanding of space and ability in breaking up opposition possession but also further forward in a more creative position, where he ranks 33rd for open play key passes per 90 (1.0), a figure that would be undoubtedly higher if he operated further up the field more often. His tenacity is matched by fine balance in possession and awareness of when to pass or to travel with the ball. His distribution is stellar and he has excellent range, whether it be raking cross-field passes or well-weighted through-balls. The fact that he’s Cagliari vice-captain, has taken penalties and is their main set-piece taker (and a very good one at that) shows a huge degree of responsibility and leadership on his part. Mentally, he’s never looked phased from playing at Serie A level to his performances with Italy. However, his flexibility can be construed as a slight negative. It’s hypothetical but his adaptability means he could find himself selected as a holding player or out wide to fulfil a task, rather than getting the best out of him. Not that he’s a jack-of-all-trades/master of none but if there is a gap in the side, the temptation would be to fill it with him rather than designating a specific position. There is also the question over where he operates best. His slight lack of consistency in the final third means he’s perhaps more suited to a deeper role in midfield even though he explained that he prefers playing on the right-hand side. At 5ft 9ins, he lacks aerial prowess, but that should not stop him from becoming a world-class defensive midfielder. Claude Makelele was only 5ft 6ins and he fared well. There is also the fact he’s never played or lived outside of his hometown. At 21, a move outside of his comfort zone would be a robust examination of his character – and one to which an adverse reaction is very possible. Does a transfer make sense? On sheer ability alone, without question. Barella is already remarkably refined for such a young player and, if his progress continues, he’ll be a mainstay for Italy over the next decade. For Klopp, to have a midfielder who can pass with the vision of a playmaker but win back possession with the discipline and timing of the very best defensive midfielders is an extremely enticing prospect, especially for a coach with such belief in the high press. What slightly clouds all this is his price at his young age, factored in with concern over whether he could adapt to life in England and the Premier League. Cagliari, understandably, value him in excess of £40million but at 21, if he is to become what he should, that represents a solid investment. The risk is, though, that he’s yet to fully mature and moving him from Italy, at a relatively small club, to such a contrasting environment and all the pressures that entails could hamper his progress.